9 songs in SKM format, over 30 minutes of music, 7 Mb archive size. Tested on win 98, 2k, XP, Vista. Win 98/Me users should download small GDI+ dll. Right mouse click - hide a player. Esc or Alt+F4 - exit. Realtime effects used a lot (reverb, delay, chorus, equalizer, filters, etc.). Slow machine users can run SimplePlayer (included) to listen to the songs without a graphic shell. Download links to a scene.org download location that does not exist (yet?). Yet. Hope, admins will copy the file from incoming soon. Yes, the link works now! Nice songs and interface, but CPU usage is 100% when I hover the cursor over the buttons or the pictures are changing. Looks like its a bug? WinXP SP2 and 1,8GHz here. Beautiful tunes and ok graphics. Sweet tunes, GUI bugs a bit here. very cool musicdisk! My favourite tune is Flower under the Rain. Others are great too! Very nice present to all women! comfortable music. nice and simple interface. this is up there with Crystal Symphonies, Bacteria and Jesterday as one of the best music disks. Nice music and beautiful GUI. :) And it's eating about 5% of my CPU. cool!!! Music quality is great! neeh, boring musicdisk. Nothing else really than the trax that arent all that interesting by my taste. Thanks to hardware failure, the zip archive on scene.org is broken. Also, the download counter was reseted to zero a few times during a week. 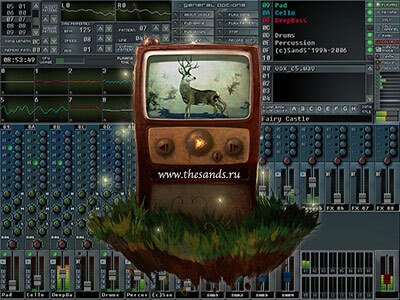 So, I uploaded the musicdisk here: www.thesands.ru/sands-skale_romantics.zip. Download and enjoy! Guess, scene.org link works fine again. interesting style. not sure it fits my current mood, but its very nice! Ahhhh, no (c)UNTZ (c)UNTZ for a change! MP3 version for OnLine listeners. page created in 0.016786 seconds with 15 queries.